World Rugby (WR) is the world governing body for the sport of World Rugby Sevens Series, the World Under 20 Championship, and the Pacific Nations Cup. World Rugby's headquarters are in  Its membership now comprises 117 national unions (100 full members and 17 associate members). Member countries must each also be members of one of the six regional unions into which the world is divided: Africa, Asia, Europe, North America and the Caribbean, South America, and Oceania. World Rugby was founded as the International Rugby Football Board (IRFB) in 1886 by Scotland, Wales and Ireland, with England joining in 1890. Australia, New Zealand and South Africa became full members in 1949. France became a member in 1978 and a further eighty members joined from 1987 to 1999. The body was renamed the International Rugby Board (IRB) in 1998, and took up its current name in November 2014. In 2009, the International Olympic Committee (IOC) voted to include rugby sevens in the 2016 Summer Olympics. World Rugby gained membership of the Association of Summer Olympic International Federations (ASOIF) in 2010. Until 1885 the laws of rugby football were made by England as the founder nation. However, following a disputed try in an international between Scotland and England in 1884, letters were exchanged in which England claimed that they made the laws, and the try should stand. Scotland refused to play England in the 1885 Home Nations Championship. Following the dispute, the home unions of Scotland, Ireland and Wales decided to form an international union whose membership would agree on the standard rules of rugby football. The three nations met in Dublin in 1886, though no formal regulations were agreed upon. On 5 December 1887, committee members of the Irish Rugby Football Union, Scottish Rugby Union (named the Scottish Football Union at the time) and Welsh Rugby Union met in Manchester and wrote up the first four principles of the International Rugby Football Board. 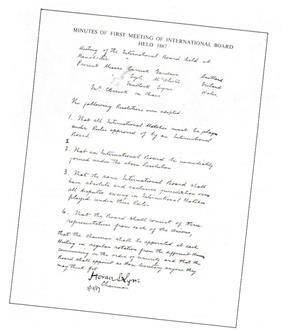 England refused to take part in the founding of the IRFB, stating that they should have greater representation, as they had more clubs. The England Union also refused to accept the IRFB as the recognised law maker of the game. This led to the IRFB taking the stance of member countries not playing England until they joined, and no games were played against England in 1888 and 1889. In 1890 England joined the IRFB, gaining six seats while the other unions had two each. The same year, the IRFB wrote the first international laws of rugby union. In 1893, the IRFB was faced with the divide between amateurism and professionalism, which was nicknamed the "Great Schism". Following the introduction of working class men to the game in Northern England, clubs began paying "broken time" payments to players, due to the loss of earnings from playing on a Saturday. Cumberland County Union also complained of another club using monetary incentives to lure players, leading to the IRFB conducting an enquiry. The IRFB was warned by all the chief clubs in Lancashire and Yorkshire that any punishment would lead to the clubs seceding from the union. The debate over broken time payments ultimately caused the 22 leading clubs in Yorkshire and Lancashire to form the Northern Rugby Football Union, a sport today known as rugby league football. England's seats on the IRFB were reduced from six to four in 1911. The Australian Rugby Union, New Zealand Rugby Football Union and South African Rugby Board joined the board with one seat each in 1948, with England's seats being reduced to two, the same as the other home nations. The three Southern Hemisphere unions were given a second seat each in 1958. The French Rugby Federation was admitted in 1978 and the Argentine Rugby Union, Canadian Rugby Union, Italian Rugby Federation and Japan Rugby Football Union were admitted in 1991. It is thought that in the late 1950s the IRFB was presented with the ideas of a world championship. In 1983 the New Zealand Rugby Football Union and Australian Rugby Union each proposed hosting such a tournament. The following year the board committed to conduct a feasibility study. A year later there was another meeting in Paris, and the Union subsequently voted on the idea. It was the South African Rugby Board's vote that proved to be crucial in setting up a tied vote, as they voted in favour, even though they knew they would be excluded due to the sporting boycott because of their apartheid policies. English and Welsh votes were then changed, and the vote was won 10 to 6. As of January 2015, World Rugby has 100 full members and 17 associate members, each of which are also affiliated to one of six regional unions. Six regional associations, which represent each continent, are affiliated with World Rugby and help to develop the fifteen-a-side game as well as Rugby 7's across the world. Not all members of the regional associations are members of World Rugby. Below is a list of member and associate unions and their regional associations with the year that they joined World Rugby. Associate unions are in italics. ^ Cameroon suspended from IRB in November 2013 due to inactivity. ^ Mauritania suspended from IRB in November 2013 due to inactivity. ^ The Arabian Gulf Rugby Football Union was disbanded in 2010. ^ UAE became the 100th full member of the IRB in November 2012. ^ a b Greece was suspended from WR membership in November 2014 pending union recognition by the government. ^ Cyprus became an associate member of World Rugby in November 2014. ^ Armenia was suspended from Rugby Europe in November 2014 due to inactivity. The Council manages and controls the affairs of World Rugby. The Council formulates and oversees the implementation of World Rugby's strategic plan and application of policy decisions, and selects the host nation(s) for the Rugby World Cup. The Council considers recommendations of the General Assembly. The Council may admit or expel member nations. The Council is also the supreme legislative authority of World Rugby. Most Council decisions require approval of simple majority, but to amend the World Rugby's by-laws, regulations, or the Laws of the Game requires approval of three quarters of the Council. The Council meets twice a year. (4) Four unions have one vote each: Argentina, Canada, Italy and Japan. (6) The six regional associations representing Europe, North America and the Caribbean, South America, Africa, Asia and Oceania each have one vote. The Executive Committee, in accordance with bye-laws 9.14 - 9.16, ensures the effective management and operation of the World Rugby. The Committee formulates and monitors the implementation of the World Rugby's strategic plan, business plan, operational plan and budget. The Executive Committee consists of 10 members elected by the Council. It is composed of the Chairman (Lapasset), Vice Chairman (Hoskins), the CEO, and seven other members. A General Assembly of the full membership is convened every two years. The General Assembly may make recommendations to the Council, and may consider business that the Council has referred to it, but the General Assembly has no legislative powers. The Chairman and Vice-Chairman of the World Rugby are elected by the Council. The current chairman is Bernard Lapasset, previously president of the French Rugby Federation (FFR). He was elected chairman effective on 1 January 2008 following the Executive Council vote on 19 October 2007. Lapasset was re-elected in December 2011 for a second term until 2016. Previous chairmen include Syd Millar (2002 to 2007) and Vernon Pugh, QC (1994 to 2002). In July 2012, Brett Gosper was appointed as the new Chief Executive of what was then the IRB. World Rugby have recently released £18.6 million of funding over three years for developing rugby nations Canada, the USA, Japan, Romania, Fiji, Samoa and Tonga. Argentina will also receive additional support to enable it to retain its tier one status. The money, built up from successful World Cups, was released following a report commissioned by World Rugby highlighting the growing disparity between tier one and tier two nations. (see IRB statement). This is in addition to the £10–12 million it normally gives out grants and tournament costs. The emphasis is on three areas infrastructure, high performance units and cross border competitions. It was announced in April 2006 that tier-3 rugby nations Portugal, Tunisia and Russia were identified as the key investment nations over the next three years. The program is designed to increase the competitiveness of international rugby union. World Rugby organises the Rugby World Cup, which has been held every four years since 1987, the sport's most recognised and most profitable competition. Despite the profitability of the Rugby World Cup, the majority of its revenues and viewers come from a small number of countries. For the 2007 Rugby World Cup final, 87% of viewers came from the Five Nations (England, France, Wales, Ireland, Scotland), 15% came from the Tri-Nations (South Africa, Australia, and New Zealand), with just 2% of viewers coming from all other countries. The most recent Rugby World Cup was held in New Zealand in 2011. The host nation defeated France 8-7 in the final, winning their second title. The next Rugby World Cup will be held in 2015 and hosted by England, while Japan will host the 2019 Rugby World Cup. World Rugby also organises the Women's Rugby World Cup, also held every four years. It was first held by the IRB in 1998, though tournaments in 1991 and 1994 were retrospectively recognised in 2009. The Women's Rugby World Cup is contested by fewer teams than the men's Cup, with only the 1998 and 2002 edition featuring more than 12 teams (these competitions both had 16 teams, compared to the 20 teams in the men's Rugby World Cup). The most recent Women's Rugby World Cup was held in France in 2014. The tournament was won by England, who beat Canada in the final 21-9. The next event is scheduled for 2017, the four-year cycle having been bought forward one year, from 2018, to ease congestion in the International Calendar. The tender process for hosting the tournament was opened on 28 November 2014. On 13 May 2015, it was announced that the tournament would be hosted in Ireland, with matches played at University College Dublin, and at the Kingspan Stadium, Belfast. World Rugby also organizes three international sevens tournaments - two annual Sevens Series (one for men and one for women), and a quadrennial World Cup. Arguably the most high profile sevens competition organised by World Rugby is the HSBC World Rugby Sevens Series. Held every year, the season long series takes place over 9 legs, each held in a different country. The HSBC World Rugby Women's Sevens Series, a 6-leg series similar to its male counterpart, is held for Women's sevens teams. Both tournaments follow the same principle, points are awarded based on a teams position in each round of the series, and the team with the most points at the end of the Series is crowned champions. Following rugby sevens inclusion into the Olympics, beginning with the 2014–15 series, the series prior to an Olympic event (i.e. the series which ends in the year before the Olympics takes place) will form the first phase of Olympic qualification. When Olympic Qualification if included, the top four teams from both the men's and women's series will qualify for the Olympic Games, remaining teams will compete in regional competitions for on of the remaining places. World Rugby also organises the quadrennial Rugby World Cup Sevens. The tournament, which includes both the men's and women's world cup tournaments, was originally due to be discontinued after the inclusion of rugby sevens into the Olympic Programme. However, it was later decided to retain the tournament, as it involved a significantly larger number of teams than the Olympics would, and to move the tournament so as to create a more even sevens calendar (with the major sevens events alternating every two years). As a result, the most recent tournament was the 2013 Rugby World Cup Sevens in Moscow, Russia. The next tournament will be held in 2018, in the San Francisco Bay Area in the USA. Pacific Nations Cup, which has been played annually since 2006. The national teams of Fiji, Samoa, Tonga, and Japan compete for the cup, and since 2013 it has also included United States and Canada. Pacific Rugby Challenge, which is a competition involving the national "A" sides from Fiji, Samoa, and Tonga (and more recently Junior Japan, Canada A, and Argentina's Pampas XV). Americas Rugby Championship, which involves "A" sides from Canada, the Argentina Jaguars, which absorbed the country's former A national side, a "USA Select XV", recognised as the USA 'A' team, and Uruguay. The sport of rugby union has been played at the Summer Olympics on four occasions, with the last being in 1924. The winners, and thus the reigning champions, were the U.S. team. Rugby union made one more appearance as a demonstration event but was then removed from the Games. World Rugby has most recently been very keen to see it return to the Games and is adamant that the sport (specifically referring to rugby sevens) satisfies every respect of the criteria set out in the Olympic Charter. The main problem for reintroducing the 15-man game to the Olympics is the 7-day turnaround required by World Rugby regulations for players to rest between games. Since the Olympics only officially run for 16 days, with only slight expansions allowed to accommodate sports such as football, this effectively makes it impossible to conduct a 15s tournament within the current Olympic schedule. This limitation does not apply to sevens, as games last only 14 minutes (20 in championship finals) instead of the 80 minutes in the 15s game. All of the events in the current men's and women's Sevens Series, which feature a minimum of 16 national teams for men and 12 for women, are conducted within a single weekend. But in furthering the World Rugby cause, the organisation became an International Olympic Committee Recognised International Federation in 1995, marked by a ceremonial signing by President Juan Antonio Samaranch prior to a match between Wales and South Africa in Cardiff. World Rugby cites rugby union's global participation, with men playing the game in well over 100 countries and women playing in over 50 as well; the organisation's compliance with the World Anti-Doping Code; and that a rugby sevens tournament could be (and generally is) accommodated in one stadium and is relatively inexpensive to play. Not only is the sevens game successful in the context of the Sevens World Series and World Cup Sevens, it is also very successfully played in the Commonwealth Games; the sevens tournament at the 2006 Games in Melbourne set all-time attendance records for a sevens tournament. As a result of this, World Rugby applied to the International Olympic Committee for a Sevens tournament to form part of the Olympics. Subsequently, Sevens has been accepted into the Summer Olympic Games and will first be played in 2016 in Rio de Janeiro. The laws of rugby union are controlled by a standing Laws Committee, which is established by the World Rugby Council. The current chairman of the committee is Bill Beaumont. The Laws of the Game are formulated by World Rugby, and are then circulated by the national Unions. The official laws of the game are written in English, French, Russian and Spanish. There are variations for under-19 and Sevens rugby. There are 21 regulations in total, these regulations range from definitions, eligibility, advertising, disciplinary, anti-doping and a number of other areas. World Rugby also approves equipment, which are tested at an Approved Testing House. In 2006, the IRB initiated proposals for variations to the laws, which were formulated and trialled initially at Stellenbosch University in South Africa. Further trials were set down for 2007 and 2008. The law variations aimed to push the balance between defensive and attacking play more in favour of attacking play, and to reduce stoppages for penalties and infringements. ^ Souster, Mark (25 February 1998). "All in a name". The Times (London). ^ a b "Rugby World Cup History". Rugby Football History. Retrieved 14 July 2006. ^ Fagan, Jack (29 October 2014). "IRB to move to new Dublin 2 headquarters". The Irish Times. Archived from the original on 19 February 2015. Retrieved 19 February 2015. ^ a b "IRB Organisation". International Rugby Board. 2006. Archived from the original on 9 July 2006. Retrieved 14 July 2006. ^ a b WR Handbook 2014, p. 20. ^ a b c IRB Handbook 2013, pp. 15-20. ^ "IRB to change name to World Rugby" (Press release). IRB. 28 August 2014. Retrieved 28 August 2014. ^ "Putting Rugby Back in the Olympics". Rugby Football History. ^ "Short history of rugby". Museum of Rugby. Archived from the original on 15 February 2008. Retrieved 14 July 2006. ^ a b "1880s". Rugby Football History. Retrieved 15 July 2006. ^ a b c "History of the laws of rugby football". Rugby Football History. Retrieved 22 October 2011. ^ "History of the Game". rugby.com.au. Retrieved 15 July 2006. ^ a b c "1890s". rugbyfootballhistory.com. Retrieved 15 July 2006. ^ "Major team and individual sports". Encyclopaedia Britannica. Retrieved 22 October 2011. ^ a b "The History of RWC". worldcupweb.com. Retrieved 28 July 2006. ^ WR Handbook 2014, pp. 13-19. ^ "International Rugby Board – Year in Review 2010" (PDF). irb.com. Retrieved 23 June 2011. ^ a b "Indonesia becomes full member and Brunei associate member of IRB as two African unions suspended". ASOIF. 27 November 2013. Retrieved 28 November 2012. ^ "UAE become 100th full member of the IRB". ^ a b c "World Rugby gives Cyprus warm welcome but Armenia and Greece the cold shoulder". ASOIF. 27 November 2012. Retrieved 28 November 2012. ^ IRB Review 2011, p. 22. ^ a b "Rugby & The Olympic Games". irb.com. Archived from the original on 8 July 2006. Retrieved 28 July 2006. ^ "IRB adopts WADA code". irb.com. Archived from the original on 4 September 2006. Retrieved 28 July 2006. ^ "Keep Rugby Clean". irb.com. Archived from the original on 14 July 2006. Retrieved 28 July 2006. ^ "New IRB Awards presentation format" (Press release). International Rugby Board. 2009-05-28. Retrieved 2009-06-19. ^ "Nine inductees to join IRB Hall of Fame" (Press release). International Rugby Board. 2009-10-23. Retrieved 2009-10-24. ^ "Stars set for glittering finale at IRB Awards" (Press release). International Rugby Board. 2011-10-05. Retrieved 2011-10-23. ^ "Chilean Rugby greats added to IRB Hall of Fame" (Press release). International Rugby Board. 2012-05-26. Retrieved 2012-06-12. 2009 – Lions tours to South Africa; all candidates for induction were either Lions or Springboks. 2011 – The year's final set of inductions, held at the IRB Awards in Auckland on the night after the 2011 World Cup Final, was, according to the IRB, "under the theme of Rugby World Cup founders, visionaries and iconic figures". 2012 – The IRB's theme for this year's inductions was Rugby - a global Game, "celebrat[ing] Rugby’s expansion to become a global sport played by millions of men and women worldwide." In 2006 an Joe Warbrick, Jack Kyle, Melrose RFC and Ned Haig (for their roles in the invention of rugby sevens), Hugo Porta, and Philippe Sella. Since then, induction ceremonies have been held annually, except in 2010. The awards that recognise achievements in the preceding 12 months tend to be won by that season's most successful nation(s): France in 2002, England in 2003, South Africa in 2004, New Zealand in 2005, South Africa again in 2007. For those award categories that have nominees, a shortlist is drawn up by an independent panel of judges, who are all former internationals. The panel then reconvenes to choose a winner. The current judges are Jonathan Davies, Will Greenwood, Gavin Hastings, Michael Jones, Dan Lyle, Federico Méndez, Francois Pienaar and past Player of the Year winners Fabien Galthié and Keith Wood, with John Eales as convenor. The judges have a total of over 500 caps between them. However, as a response to the Great Recession, the annual ceremony only saw the International Player, Team, and Coach of the Year Awards presented in 2009 and 2010; all other awards were presented at different times throughout the year. The IRB reinstated a single year-end ceremony in 2011 after the 2011 Rugby World Cup. Since then, it has chosen to present some awards at times relevant to those specific prizes—such as Sevens awards after the London Sevens, the final event of the Sevens World Series, and the Junior Player award after the final of the Junior World Championship. The bulk of awards will be presented at the year-end Awards ceremony. The World Rugby Awards were introduced in 2001, to honour outstanding achievements in rugby union. Prior to 2009, all of the awards were announced at an annual ceremony; the most recent such ceremony was held in London on 23 November 2008. Currently all capped international matches are equally weighted, whether or not they take place within a competition or are played as tests; the sole exception to this is the World Cup final tournament. If a nation does not play for a number of years they are considered dormant, and excluded from the rankings, upon returning, picking up from where they were excluded. If a nation is to merge or split, the highest rating of any of the rankings is inherited. The system's reliability is assessed in a number of objective ways, which includes predictions of current strength and responds to changes in form. The system takes into account home advantage, in that the home nation is treated as though it has an extra three rating points, effectively handicapping them, as they will gain fewer ranking points for a win, and lose more should they lose. In the case of a freak result, there is a maximum number of movements on the ranking that any nation can gain from one match. World Rugby publishes and maintains the World Rugby Rankings of the men's national rugby union teams. The concept was launched in October 2003, at the start of that year's world cup in Australia. The rankings are calculated using a Points Exchange system, whereby nations take points off each other based on a match result. Several years of research went into developing the rankings system, using an extensive database of international matches that date back to 1871.